Everybody calls this the haunted cemetery. Even your friends have their own accounts of the mysterious and creepy things they experience here. You pass by this place every afternoon after school. However you haven't experienced any creepy stuffs. Instead, you have fun passing here as you can hear various noise. These noise would have scared people, but you simply enjoy the variety. But as days go by, you notice that the cemetery has gotten darker. You look up at the trees and they have more leaves than usual. You're thinking this might be because of the changing seasons. Then again, it doesn't seem to change anymore and just stick to the darkness it has now. Maybe it's just the trees' way of coping. Or something else is making them produce more leaves so the place will become darker. The noise doesn't sound so fun anymore as well. Then slowly you begin to accept your friends' stories. You want to avoid it as much as possible. However, when things change and you're not expecting it, it comes across as shocking at times. And you find it hard to go back to your previous line of thinking. Still, you want to prove your thoughts otherwise. So you enter the cemetery. 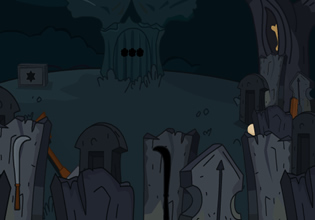 Play Haunted Cemetery Escape (Mirchi Games) outdoor escape game by Mirchigames.